Susan has long been known as the pie baker in our family. Her crusts are always flaky; no one else can seem to master the skill. She says that it is something her mother taught her, and that the only secret is to keep everything cold. Because of her reputation, she was drawn to a new cookbook on Sarah’s shelf when we were in San Francisco. The book is titled, The Four & Twenty Blackbirds Pie Book, (Grand Central Life & Style, New York, 2013). It won an award by the James Beard Foundation as one of the best cookbooks of the year. The recipes sound wonderful, and the illustrations are beautiful. 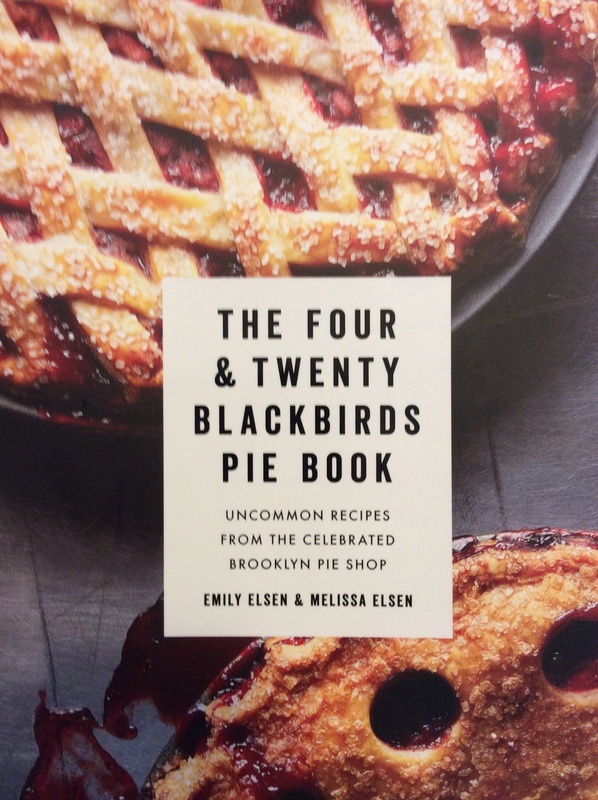 On top of that, the authors are two sisters, Emily and Melissa Elsen, from South Dakota who have gained fame in Brooklyn running a pie shop with the same name as the book. The two women hail from the little town of Hecla, population 224 ±, located just a few miles northeast of one of the main metropolises of South Dakota – Aberdeen. That’s where many of my relatives live and close to where both of my parents grew up, so it has some personal interest. I ordered a copy of the book so that Susan could study it while we were in Los Angeles with our grandchildren there. I was hoping she would be inspired to bake, and I was not disappointed. She baked two pies that both disappeared quickly. 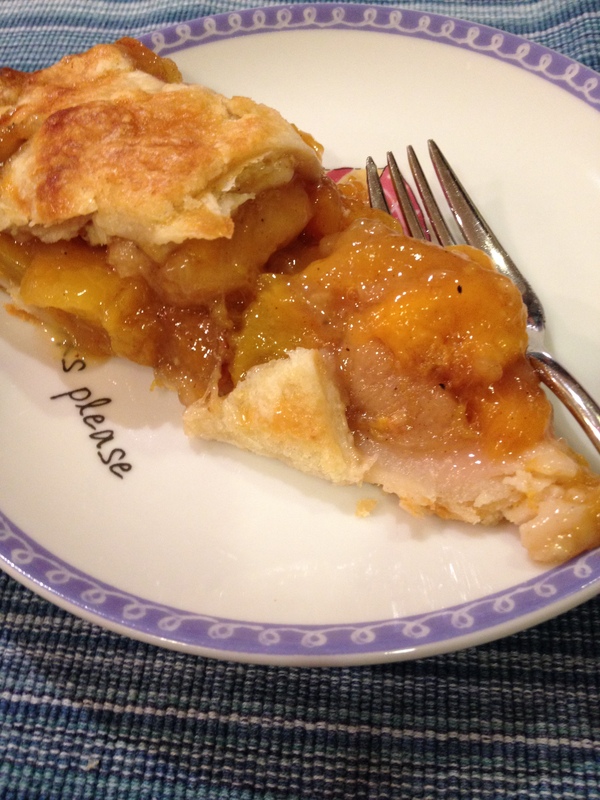 The first pie was a lattice-topped peach pie. Susan usually makes her crusts with vegetable shortening, but this time she followed the cookbook and used pure butter. 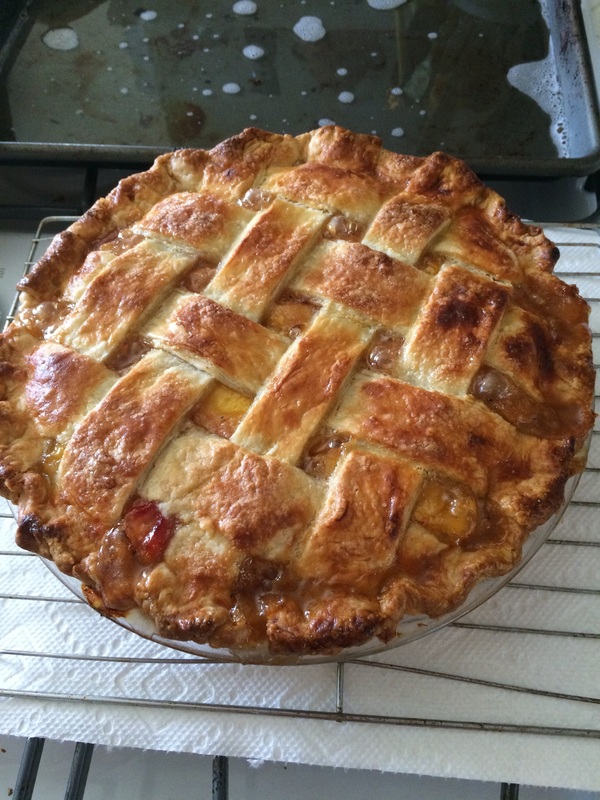 It turned out not to be as flaky, but the flavor was outstanding. Judge for yourself about the beauty. Peaches came from the local farmers market. 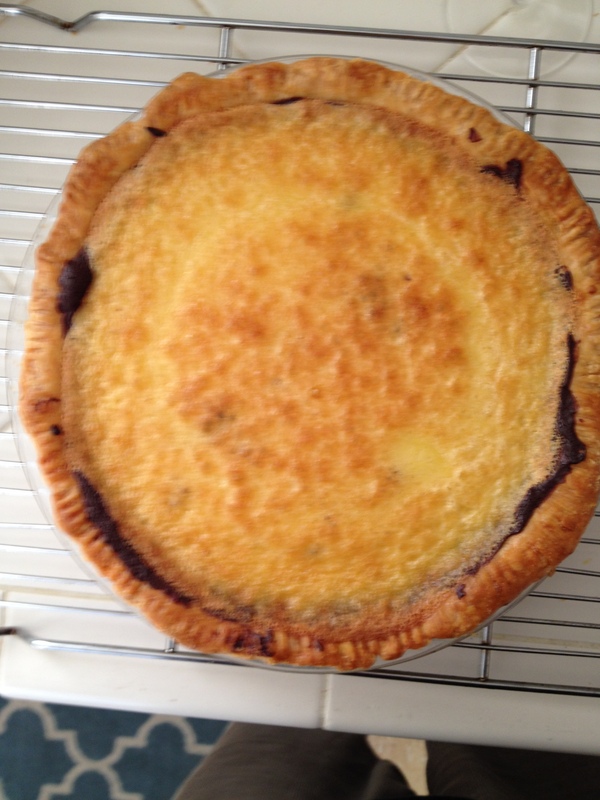 The second pie was a black bottom lemon pie. Susan again used pure butter for the crust. For the filling, she made ganache and a lemon curd according to directions from the cookbook. The only change to be made was that the recipe called for 30 minutes in the oven. In the end, it took twice that much time, although that could have been because of the oven. In any event, a warning to watch the baking time, and make sure that the lemon curd has set up at least three inches from the edge of the pan before you take it out to let it continue cooking while it is cooling. Glad the Pie Lady has not lost her touch, and with this beautiful cookbook, she may continue to surprise us with new delights. This last week our traveling child care project moved to Los Angeles. We had assumed that watching teenagers would be easier than toddlers. In some ways we were right. The teenagers clearly have required less direct supervision, and there is not diaper changing. Scheduling is the main problem. Both require transportation to and from school as well as extra-curricular activities. The high school student has a variable schedule: sometimes she needs to be at school at 7:30 and sometimes she doesn’t go until 8:30. There seems to be no fixed schedule. In the evening she has practice for the swimming team. That cuts into the dinner hour. Then she disappears into her room for a prodigious amount of homework. The middle school student has a different schedule,. He has his own homework, and grandparents are supposed to help in the absence of parents. What? I can barely remember my own name. Even though the two schools are only a few blocks apart, dropping off and picking up require at least five and sometimes seven separate trips a day. It is a mystery to us how our daughter and son-in-law can get all of this accomplished and still both hold down full-time jobs with commutes of at least one hour each way. Susan and I had planned to use our spare time doing some of the things in LA that we have wanted to do. We didn’t get that accomplished; mostly we just wanted to take a quick nap. The one outing we were able to accomplish was a visit to Terranea Resort with a nice lunch at one of their restaurants. Southern Californians are almost as crazy about golf as they are the beach. In the community where our family lives, there are five golf courses, the oldest dating back to over ninety years ago. The most recent additions are the Trump National Golf Course Los Angeles, and its arch competitor, Terranea Resort. Both are built on the cliffs overlooking the Pacific Ocean and offer stunning views, especially at sunset. Both offer luxurious resort facilities, and both have excellent restaurants. Locals seem to prefer Terranea, but that suggestion runs the risk of being a political commentary in this day and time. 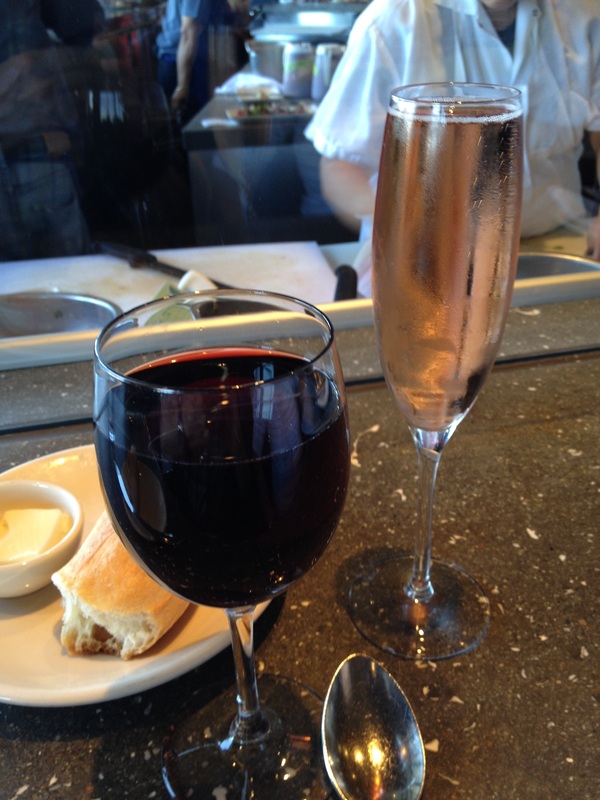 We chose to go to the Catalina Kitchen at Terranea. The restaurant is beautifully appointed with a comfortable indoor dining room and an outdoor terrace that looks out on the ocean. The wait staff is very professional but friendly; they know the menu inside and out. The menu is filled with old standards, but the big surprise is that the chef has added new and creative twists to items that have gotten a bit ho-hum. Susan ordered crab Louie, which came piled high with fresh Dungeness crab. I ordered the Caesar salad with salmon. It came with beautiful croutons on the side (They were not out of a package). The dressing had just a hint of anchovy, and on top were beautiful filets of white anchovy. The salmon was perfectly cooked with just a light glaze, and it was a generous portion. With all of that, the highlight of the meal was fried deviled eggs. They were singularly delicious. 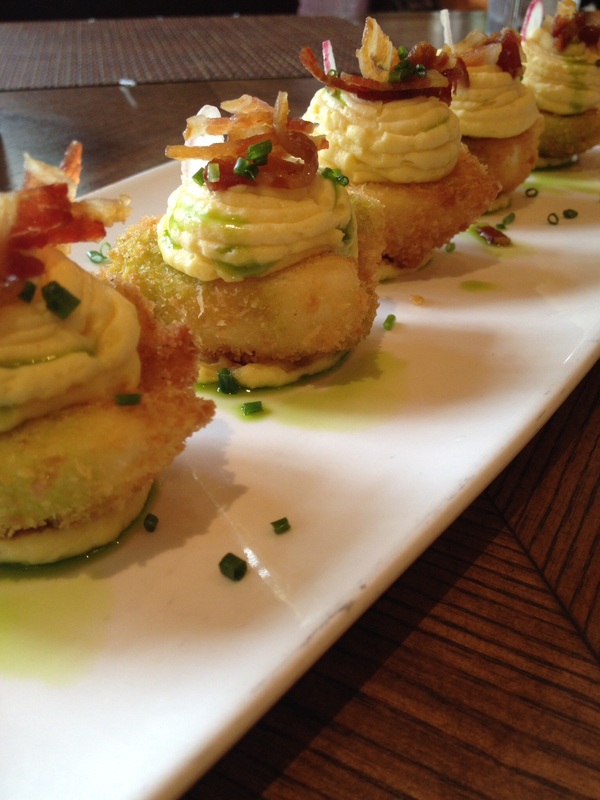 They were served in a little pool of bright green basil-infused olive oil, crusted with a lightly browned panko, and topped with a bacon chiffonade and a tiny slice of radish so thin that you could see through it. I have tried to put my spin on that dish. My version is nowhere as elegant as the model, and it took more effort than the usual deviled egg, but it wound up being fairly tasty. I added smoked salmon to my version, which I thought gave it a nice taste. This recipe makes six deviled eggs, but you can expand the recipe as needed. Hard boil the eggs according to your usual method. Chill in ice water. Peel. 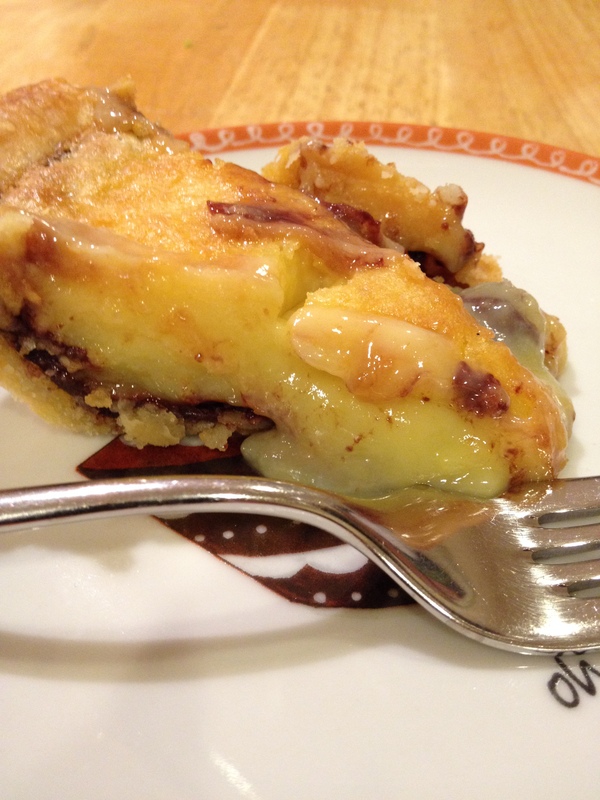 Cut in half lengthwise. Remove the yolk and set aside until ready to fry and stuff. Press the yolks through a strainer or sieve into a small bowl. Stir in the mustard and dill. In a small food processor, pulse the smoked salmon until smooth. Stir into the egg mixture. Adjust seasoning with salt and pepper. Add optional Tabasco to taste. Prepare the breading by placing the flour, egg white mixed with water, and panko in individual small bowls large enough to accommodate the egg white cases but small enough so that they can be completely immersed. Dry the reserved egg white cases. Dip the cases into the flour, dusting off any extra. Dip in the egg-water wash, coating completely but draining any extra liquid from the hollow. Coat with panko. Using a spider or slotted spoon, transfer the coated egg whites one by one into frying oil, about 2 inches of vegetable oil heated to 350°F,, turning until browned on all sides. Transfer the fried egg white cases to several thicknesses of paper towel, using the same spider or slotted spoon to keep the coating intact. Cool. With a pastry sleeve fitted with a large star shape, pipe the filling into the egg white casings. Garnish with a few capers, some of the snipped dill and snipped chives. Serve. Last week while we were in San Francisco, our son and his family came up from Silicon Valley to spend Sunday with us. Susan rested to catch up with a week of intense child watching while René generously took the four kids to one of the playgrounds on the Presidio. That gave me an opportunity to take Peter to brunch. We haven’t had a time alone for a long time, so both of us seemed to relish the opportunity. We went to the Presidio Social Club, which has become one of our favorite restaurants on the Presidio. It is housed in a very old barracks building that has been restored and filled with pictures and memorabilia from the days when the building served as a canteen during the Second World War. We enjoy everything about the place: the atmosphere is inviting, the service is good, and the food is very good without being too expensive. Besides all that, it is a short drive through the woods of the Presidio so you don’t have to get out on the busy streets of the city and spend a long time looking for a rare parking space. The brunch menu is filled with the usual sorts of things that people order on a lazy late Sunday morning. Peter ordered a PSC Spritzer and I got a PSC Bloody Mary. Then we checked out the menu. Both of us focused on the chilaquiles as they are a favorite of everyone in our family. Peter and I have this funny custom that if one orders a dish, the other does not. We agreed that he should order the chilaquiles. Then I saw the huevos rotos. The dish was described as eggs, potatoes, and chorizo. It sounded sort of like my usual, huevos rancheros, and had the additional intrigue that I had never heard of it before. So I ordered it. In El Paso, I had eaten huevos divorciados – two eggs separated by chilaquiles or refried beans and topped one with green sauce and one with red. I had eaten huevos revueltos – scrambled eggs – and migas – eggs with chorizo and crisp tortilla strips. There’s machaca with eggs – shredded beef and eggs. And of course, the ubiquitous breakfast burrito. I had never eaten or heard of huevos rotos. In part that’s probably because it is originally a Spanish dish. The version of huevos rotos served by the Social Club was so good, that I decided to try to replicate it at home. Here’s my version for 2 persons, but you should be as creative as you want with additional ingredients. I think you will find the dish so good, and so easy, that you will make it often for breakfast, lunch, or a snack. In a saucepan, boil the potatoes, unpeeled in salted water for about 10 minutes or until slightly soft but not cooked through. Remove from the heat, drain, and cut the potatoes into ½ inch chunks. In a skillet over medium heat, sauté the potatoes in enough oil to coat them. Toss frequently until lightly browned. Stir in the chopped onions and crumbled chorizo. Continue to sauté. Sprinkle with hot paprika, and adjust the seasoning with salt and pepper. Drain off any extra fat, transfer to a plate, and keep warm, covered loosely with foil, in a 170°F oven until ready to assemble the dish. Divide the potato-chorizo mixture equally between two warm serving plates. Top with Sriracha if desired. In a small non-stick frying pan, fry the eggs in oil over medium-low heat, turning once so that they are over-easy and the yolks remain runny. Top each plate with two over-easy fried eggs. Pierce the eggs with a knife so that the yolks run over the top of the dish. Serve immediately. Hog Island Oyster Company is on Tomales Bay, just a short, beautiful drive north of San Francisco. Once there, you can buy unshucked oysters and other shellfish to take back home with you, or you can have all varieties of raw and cooked oysters, clams, and mussels in a spacious restaurant with great views of the bay. Don’t worry if you can’t make the time to take the drive. 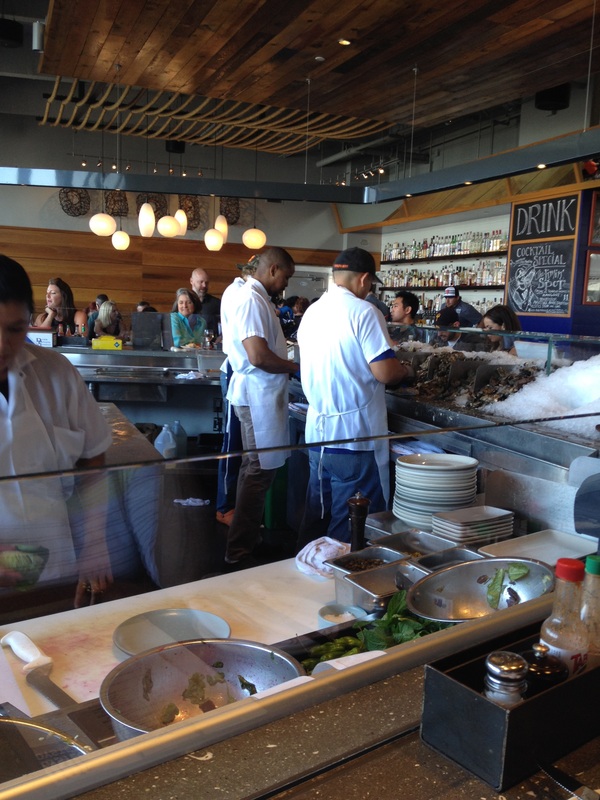 You can still get fresh oysters at the Hog Island Oyster Company at the Ferry Building in San Francisco. The Ferry Building is one of the great destinations for visitors to the city. 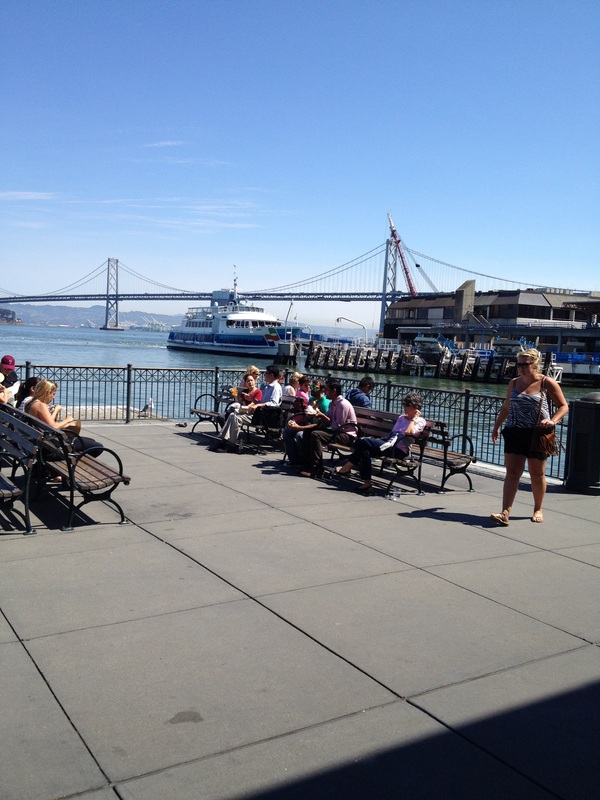 It has been lovingly renovated and occupies a dominant place on the Embarcadero. On Saturdays it serves as home for a huge farmers market where all of the city’s chefs shop. You are likely to catch a glimpse of someone you have seen on television or in whose restaurant you have eaten. The Ferry Building is lined with shops filled with hard-to-find food, well-known products like Cowgirl Creamery cheeses, pottery, jewelry, and expensive one-of-a-kind kitchen gadgets. The building sits right on the water because in times past it served as the terminal for the many ferries that crossed San Francisco Bay. Now the Oakland Ferry has a berth just a few steps away from the restaurant of the Hog Island Oyster Company. The beautiful new Bay Bridge makes a perfect backdrop, so that Hog Island is a popular stop for locals and tourists alike. Expect a crowd on the weekend or when the weather is beautiful. That means you will have to wait, but the line moves quickly. It moves even more quickly if you get a bloody mary from the bar to pass the time. Of course, outdoor seats are at a premium, so you may have to wait a little longer for them. But seats at the counter are often available, and to me they are preferable. You can watch the woman who runs the garde manger station as she whips up salads with blinding speed. Her knife skills are amazing as she cuts fresh basil into a fine chiffonade while she surveys the dining room. You can also watch the three oyster shuckers working non-stop to fill all the orders for oysters on the half shell. 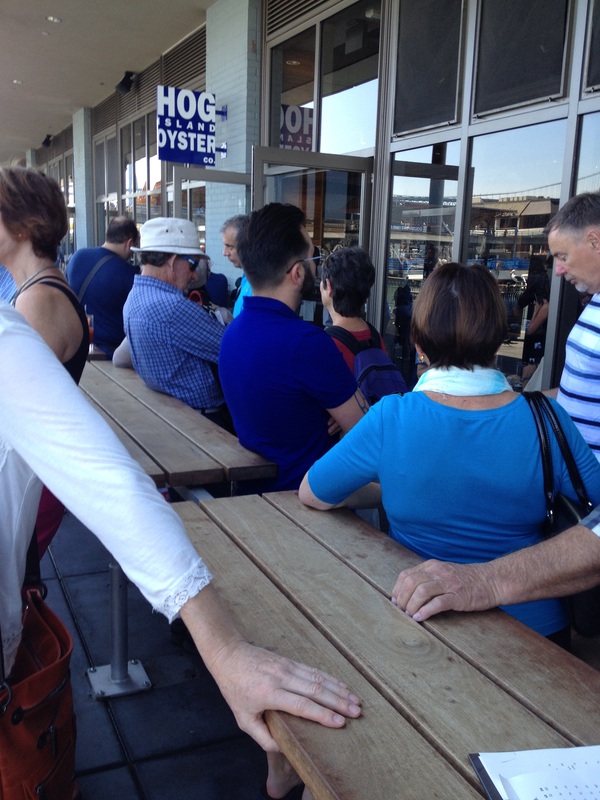 Whenever we visit San Francisco, we almost always make at least one pilgrimage to Hog Island, and we almost always order their biggest tray of raw oysters – 2 dozen, mixed. 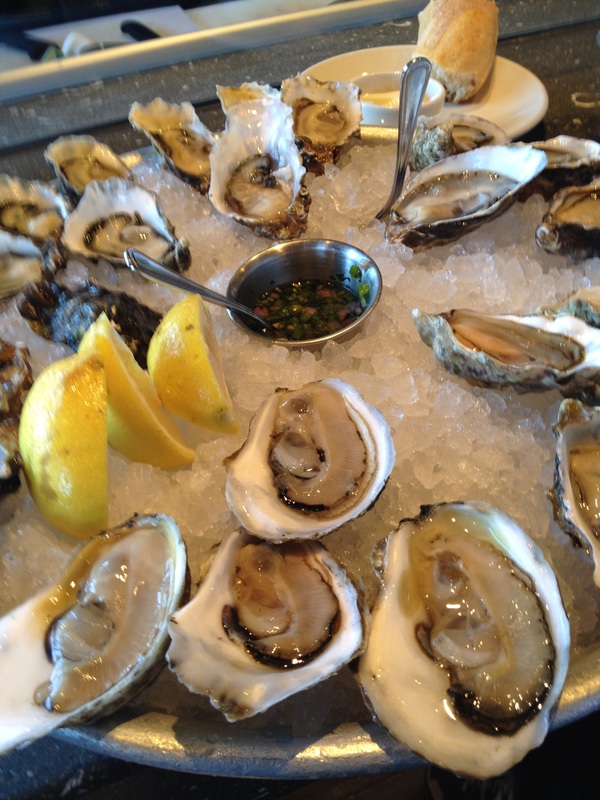 This time there were seven different kinds of oysters, so they sent out four each of six kinds. 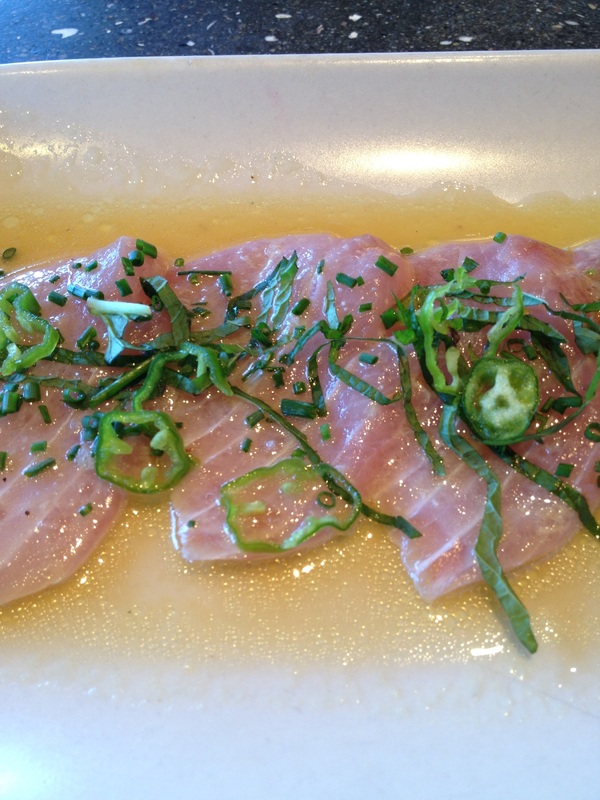 We asked for Kumomotos, our favorite, but they did not include Hog Island’s own Kumomotos. They are beautifully fluted and much smaller than other varieties, but they have a sweetness, brininess, and flavor that are unique. 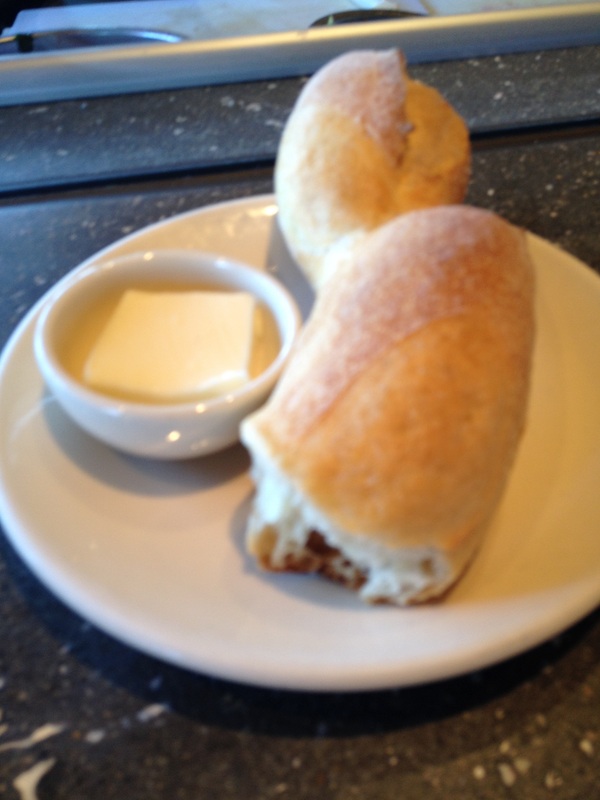 When we complained to the waiter, he promised to bring out some more, and he did. Then we recognized him as a server who had worked at Rich Table when it first opened. We had a nice visit with Charles and then got down to business: eating all of those oysters with a tasty mignonette along with glasses of refreshing wine. Next came a plate of yellow fin crudo prepared by the garde manger lady and topped with her incredibly fine basil chiffonade. Susan had an oyster roast instead of her usual clam chowder. 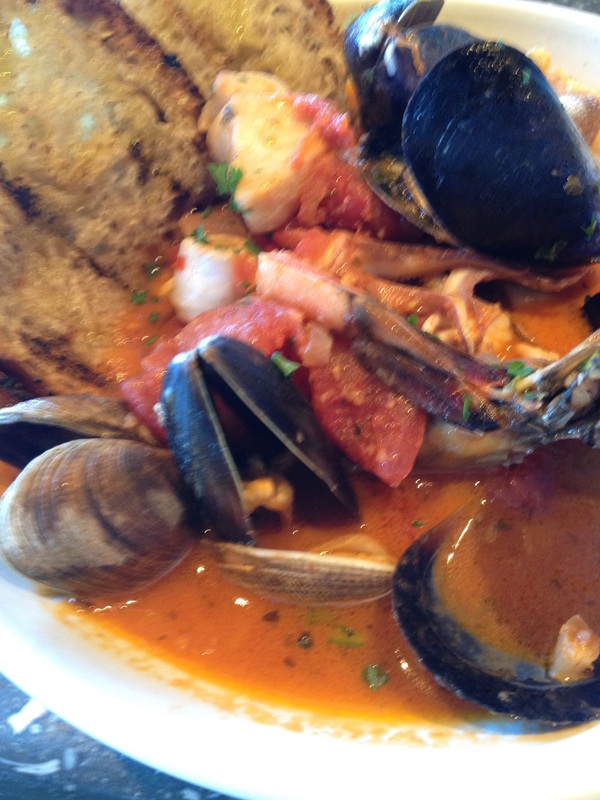 I finished up with rustic seafood stew. I asked why, if this is San Francisco, it’s not called ciappino. The reply was that it didn’t have the crab required to call it that. It had everything else. Tentacles of the calamari, heads on the shrimp, clams, mussels, chunks of white fish, savory broth, and toasted Acme bread to soak up any leftover broth. If there would have been. Then home to catch a quick nap before it was time to pick up they boys. We’ve been traveling west again. This time we will be itinerant baby sitters as we visit San Francisco so that Sarah and Evan can cook at an event in Maui, then on to Los Angeles so that Carol can attend a meeting in Washington, D.C., then back to Silicon Valley so that René can give a talk in the Czech Republic, and finally back to San Francisco while Sarah and Evan go to Shreveport. We’ll be gone for a month, so we have taken the opportunity to drive with a car loaded with stuff we are giving to our family as we try to downsize. That travel also suggested that we could take some of the back roads we have been wanting to visit for many years. First stop was Sky City. This is the ancient part of Acoma Pueblo. Even though there are now only a few permanent residents, the community is made up of two- and three-story houses made of stone and adobe. The town and its residents have been photographed by many famous and not-so-famous photographers including Edward Curtis and Ansel Adams. The church is particularly photogenic. The most direct way to get there is to get off I-40 at Exit 108 – which isn’t marked (Probably because it is the exit for the Laguna Pueblo Casino). The exit at the Acoma Casino is marked, but the roundabout is confusingly labeled, and it is easy to miss the turn and wander around on back roads. These days you go to the visitors center to board a bus for a trip to the top of the mesa. The tour starts every hour on the half hour – though sometimes not. For a fee, you can take a camera. The day we were there a sign at the front of the center read, “No cameras today.” Once inside, my wife was told that the sign was for yesterday but that she could not take her binoculars, which were strictly forbidden. We had missed the tour, but we were told that we could take in the museum – except that the museum was closed. We decided not to wait. Perhaps our timing will be better on our return trip. Acoma is most noted for its pottery. Here are some examples from our collection. Inscription Rock (El Morro National Monument) should not be missed if you are on the back roads. The scenery is beautiful, including the edge of the Malpais National Monument with its miles of interesting lava formations, mesas, and pine forests. 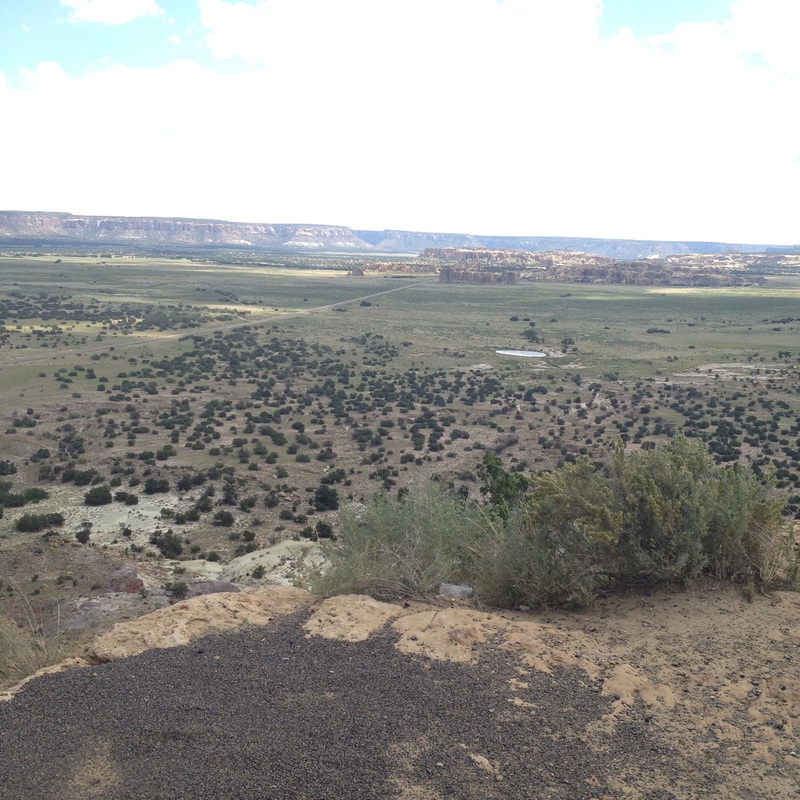 The route is now isolated, but for centuries it was the main trail between Acoma and Zuni Pueblos. After the Spanish arrival, it became a path to the South Sea. California immigrants passed here during the westward expansion, US soldiers and even Union Pacific agents exploring a railroad route stopped at the prominent bluff. They paused at the pool of water at the base of the cliffs and carved their names in the rock. Messages include those of Oñate, the conqueror of New Mexico who cut off the feet of men of Acoma who revolted, along with de Vargas who reconquered New Mexico after the Pueblo Revolt of 1680. This historic and magical place would have been destroyed if the AT&SF railroad hadn’t beaten UP to the punch in building a railroad further to the north where the busy interstate is now located. 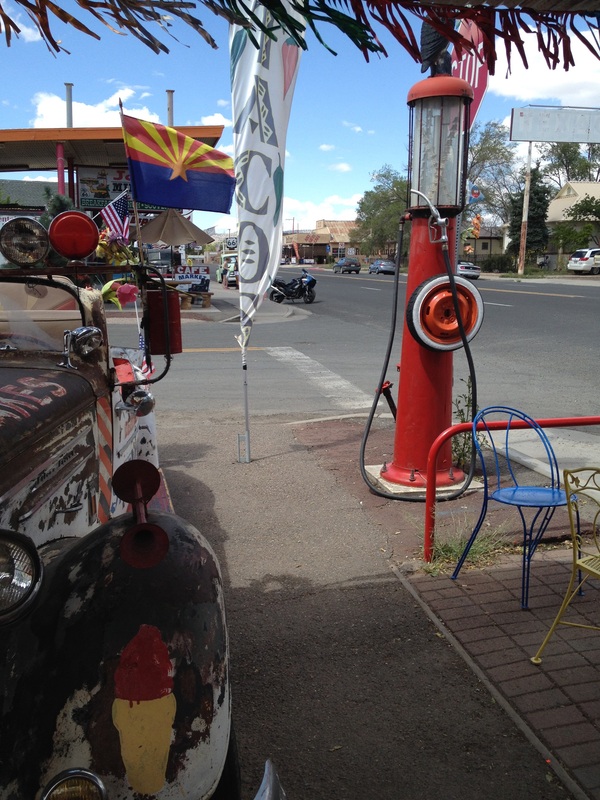 We went through Seligman, Arizona, on the historic Route 66, for ice cream. The town was filled with European tourists anxious to get a glimpse of the “Mother Road” and also some refreshments. Seligman is also the inspiration for the town where Lightning McQueen met his sidekick, Mater, in the classic cartoon movie, “Cars”. Downtown Seligman on Route 66. Where’s Lightning McQueen? Our final stop for the day was the historic La Posada in Winslow, Arizona. The hotel was designed in 1929 by Mary Colter, the famous woman architect who also designed several other grand hotels for the Santa Fe railroad and Fred Harvey hotels. Some still stand, including the famous hotel on the South Rim of the Grand Canyon. Unfortunately, La Posada had been long ignored and was about to be demolished. It was rescued by the present owner and lovingly restored. As well, it has been decorated with paintings by the owner’s wife and sculpture by their business partner. The restaurant, the Turquoise Room, is the biggest surprise. It is undoubtedly the only high-end restaurant on I-40 between Albuquerque and Los Angeles. We always stop and enjoy the food. This time was no different. The comfortable bar is decorated in the style of a 1930s railroad club car. The dining room is done in the same era, but the food is very modern. For dinner we had cream-cheese-stuffed squash blossoms. I had their “Signature Soup” topped with the initials of the restaurant in chile cream. Then I had shrimp with spinach pappardelle, and we enjoyed a Grand Marnier chocolate soufflé for dinner. For breakfast, Susan had Harvey Girls style orange pancakes with almonds, and I had Arizona green chile eggs, a riff on huevos rancheros which substituted polenta for tortillas. Probably the last good food we would enjoy until we got to San Francisco. Many years ago I did a lot of executive recruiting for my organization in Shreveport, Louisiana. Whenever someone – especially a recruit– comes to Louisiana, he or she expects to eat well. Shreveport, like most cities in Louisiana, has a number of excellent restaurants specializing in a variety of cuisines, many with a Southern or Creole emphasis. In my recruiting days, the Cambridge Club was the best of the best. It was actually a private dinner club run by two cousins from Italy, Vincent Campanella ran the front of the house, and Giuseppe Brucia commanded (my choice of words) the kitchen. They were both trained at a famous Swiss hotel and restaurant school in Lucerne. How they got to Shreveport was anyone’s guess, but nobody cared because the setting, service, and food were so good. On special occasions like birthdays, anniversaries, and celebrations I would take the family to dinner. They loved to go, first stopping at the front door of a beautiful house that evoked the Cotswolds to be greeted by a doorman who came out of a bright red English telephone booth and then escorted into a candlelit room with attentive waiters and delicious food. Unfortunately, the Cambridge Club is long gone. Vincent retired years ago and Giuseppe opened his own place with a gigantic kitchen and dining rooms filled with patrons wolfing down huge plates of spaghetti and meatballs. Vincent and Giuseppe sold the Cambridge Club, and after only a few years it folded. That seems to be the story of so many legendary restaurants. One of our family favorites on the Cambridge Club menu was a mushroom salad topped with a dab of red caviar. We talked Chef Brucia into giving us the recipe, and it was copied into our family recipe file in the teenage hand of our older daughter. Susan’s favorite salad was a leek and mushroom salad, but since our daughter runs from anything that remotely smells or tastes like an Allium, she did not copy that recipe. With a very sharp knife, slice the leeks crosswise as thinly as possible. Rinse in a colander to remove any bits of sand and dirt. Refrigerate in ice water until ready to use. With a paring knife, peel the mushrooms. Slice crosswise as thinly as possible. Save the peelings for vegetable stock if you wish. Assemble the salad by placing a nest of mesclun on individual serving plates. Drain the leeks. Divide the sliced leeks and mushrooms among the plates. Top with slivers of Parmigiano-Reggiano or Asiago shaved as thinly as possible with a vegetable peeler. If you are feeling flush, add a dab of red caviar to the top of each serving. Remember, this is purely optional.